B-1 and B-2 can also be heard on Mercury 11069 / 11069x45. BTW, 11069 (78rpm) contains alternate version of B-1. B-3 and B-4 can be also heard on Mercury 11083 / 11083x45. Too-famous recordings, two by the trio, the rest by his own solo. How could we explain the gruesome, awesome, stained play of “Parisienne Thorofare” and “Tea For Two”? Again, the cover artwork was done by David Stone Martin - great! Recent CD reissue (Verve 314 827 901-2 contains two alternate takes of B-1. 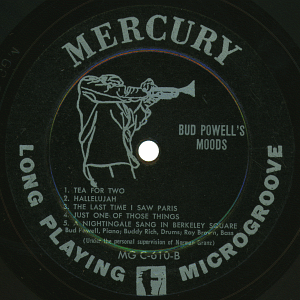 Bud Powell (p), Ray Brown (b), Buddy Rich (ds). 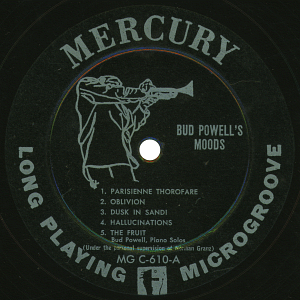 Recorded in New York City, July 1950. 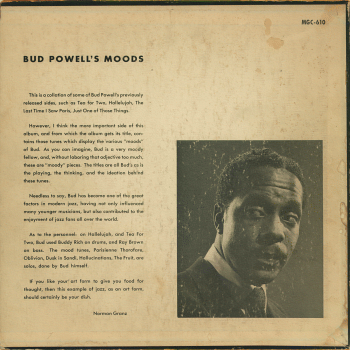 Bud Powell (unaccompanied piano solo). Recorded in New York City, February 1951.
visitors to this page since June 09, 2003.